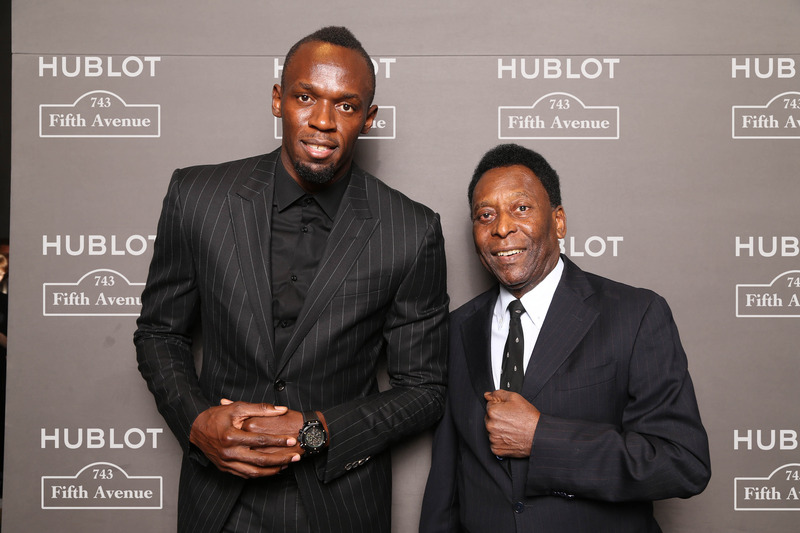 20th April 2016 – Luxury watch brand Hublot launched two new Usain Bolt signature edition watches in conjunction with their boutique opening on Fifth Avenue in New York. The watches are called the Big Bang Usain Bolt and come in black and gold. 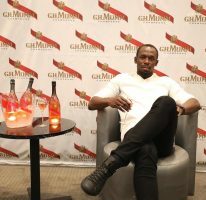 Usain and football legend Pele were the special guests at the store opening. Hublot celebrated the grand opening of new, global flagship store by Peter Marino on the iconic Fifth Avenue with a series of unique and exciting events honoring 10 Year Anniversary of All Black. 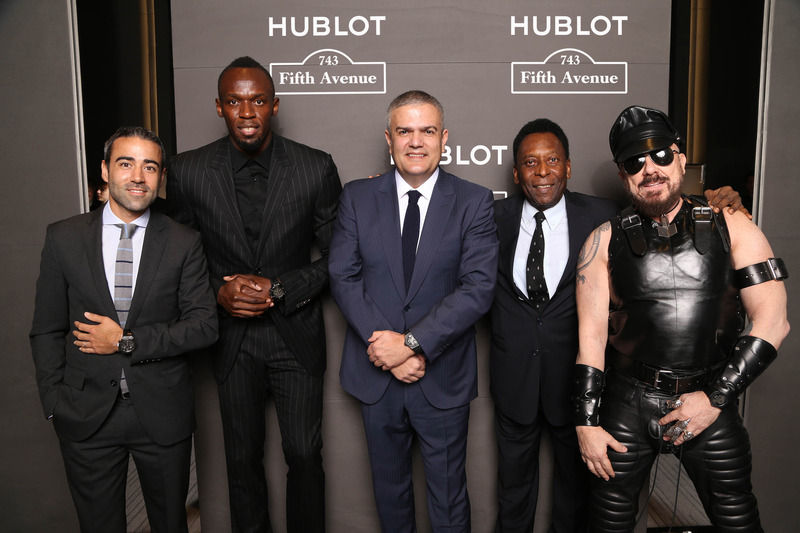 The new boutique, at the center of New York’s premier luxury shopping district is designed by architect Peter Marino and is Hublot’s largest retail location in the United States. 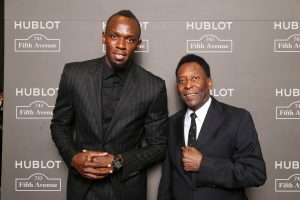 Ricardo Guadalupe joined together with Brand Ambassadors Usain Bolt and living legend Pelé to host the ribbon cutting ceremony outside of the boutique before inviting guests to experience the World of Hublot inside. As the gentlemen gathered in front of the boutique, eyes were directed skywards as a duo of acrobatic dancers descended from the rooftop and danced across the incredible façade until they reached the ground to present Usain Bolt with his newest limited edition watch, just in time for the upcoming Games in Pelé’s native Brazil this summer. Guests, including international and local media, VIPs, and friends of the brand, were then invited inside to explore the new boutique. 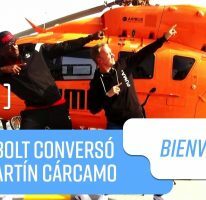 After the dynamic dance routine, Peter Marino, architect of both the building and the boutique, cut the ribbon, along with, Ricardo Guadalupe, Usain Bolt and Pelé. The new space at 743 Fifth Avenue is the latest in the long collaboration between Peter Marino Architect and Hublot which began in 2010 with Marino’s design for the flagship in Place Vendome, Paris, the first of the 5 boutiques that followed. The boutique’s design exhibits the brand’s DNA of luxury and innovation combined with its Art of Fusion concept of unexpected combinations. The new façade, lit with LEDs and faceted with powder coated black aluminum panels rise 70 feet (21m) above Fifth Avenue and is the brand’s tallest in the world. The boutique’s décor reflects Hublot’s use of unique materials, which maintains a prominent role in the brand’s watchmaking design. The 1500 square feet (139m2) interior, the brand’s largest in the US, conveys a contemporary style, with black lava stone and wood floors, graphite-colored leather furnishings, glass and polished stainless steel fixtures, and high-tech innovations including “shadow-less” LCD vitrine windows, sophisticated yet unobtrusive lighting, a wall of monitors, and a “book” with virtual turning “pages”, each showing a part of Hublot’s history, in the main window on Fifth Avenue. An untitled 2014 painting by the artist Albrecht Schnider seems to “float” in front of the smoked gray floor to ceiling mirror in the back of the boutique. The space reveals a fusion between premium materials and a luxurious yet modern aesthetic. 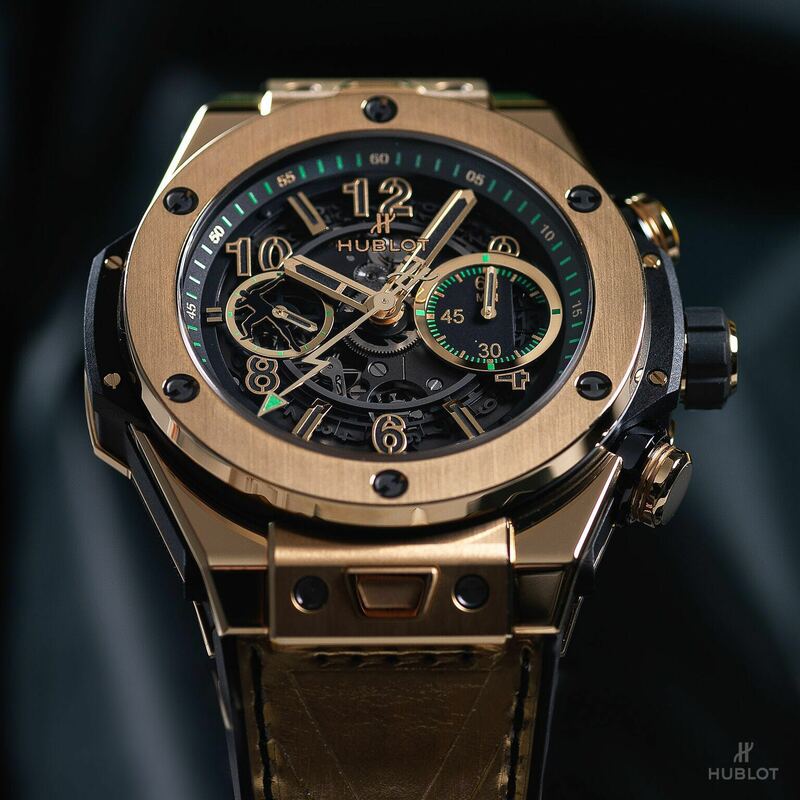 Inside the boutique, guests were given a chance to view Hublot’s newest timepiece in honor of Usain Bolt – the Big Bang UNICO Usain Bolt – designed in collaboration with the world’s fastest man. 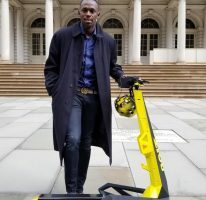 The piece – interpreted in both a bold yellow gold version and a ceramic version edition – features a masculine and sporty design with gold and green hues, a nod to Usain Bolt’s signature colors, and a strap embossed with the Jamaican flag to pay tribute to Usain’s home country. The brand’s in-house UNICO movement with flyback chronographic can accurately time any race, but his version alone has Usain’s signature “lightning bolt” as its second hand. Each piece will be offered on a limited edition basis.